Vendors are everywhere in Harare. They sell everything from steering wheel covers, to cheap padlocks and of course food. 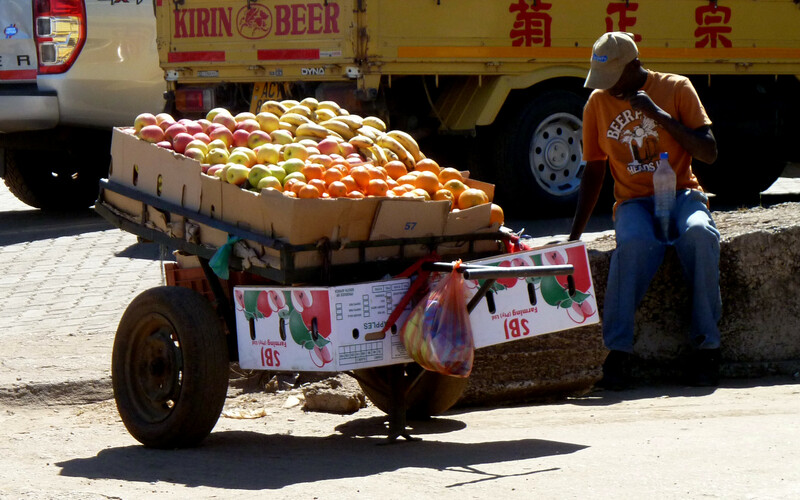 The fruit vendors are especially numerous in the industrial sites where I spotted this one and they do a brisk trade at lunch time. Yes, I have in the past bought fruit off them and they will even offer to wash it for you and carry a bottle of water specifically for that purpose. There is of course no guarantee that the water itself is clean; it could be out of a tap at the back of a factory and one drinks tap water at one’s peril in Harare. Of course there is no saying that the vendor doesn’t have a swig out of the bottle now and again. Would YOU not drink out of the bottle of water you were carrying on a long, hot and dusty day?